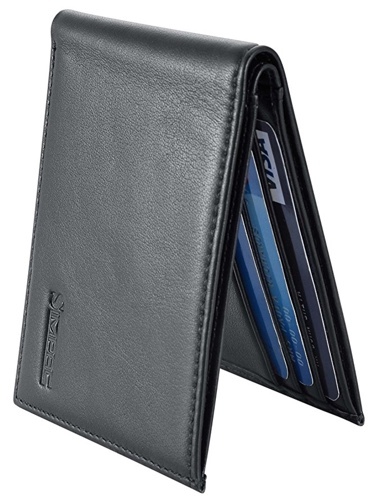 Bifold wallets are one of the most common ways that men carry credit cards and money today. It’s the method that I use, and something that millions of other men rely on as well. Unfortunately too many of these wallets suffer from bloat. They’re too large in construction, they take up too much space in the pocket. These wallets are a serious burden to carry around, and they don’t seem to be meant for everyday use. This is an issue that’s best addressed by getting a new billfold wallet entirely. Many on the market are too bulky, but there are some slim and sleek options as well. The tough thing is tracking down quality sleek wallets, and separating them from all the junk that’s flooding the market, because there is a lot of that when it comes to wallets. It’s too easy to pick up a low quality product that’s going to fall apart just months after you start using it. After years of carrying around a bulky wallet, I decided enough was enough, and tracked down slim options that would slip right into my front pocket. The relief was immediate, and the only wish I had was that I made the move sooner. Wallets daily tools, and they should be comfortable and convenient. I’m going to outline some of my most favorite bifold wallets. They’re slim, they’re attractive, they’re strong. They’re everything that makes up a good solid wallet. Hopefully the review will help a couple people upgrade to a better option. If not, it will at least give you an idea of what’s out there for the future. Beautiful finish – Some buyers don’t care about the look of a wallet, but most do. A wallet should serve as a fashion statement as well as a tool. It’s best if it has an attractive look that you enjoy. The Polare Men’s RFID blocking Italian leather wallet is a good manly wallet that combines all the desirable features into one package. 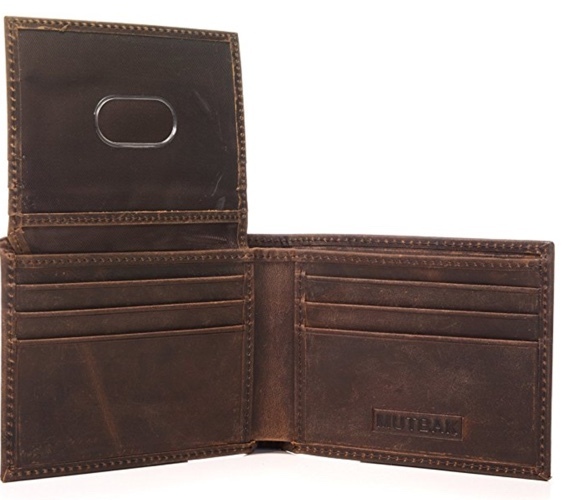 It’s made from quality leather and rugged stitching for a strong and sturdy feel. The wallet has a slightly worn look to it, and no branding for a classy appearance that any leather lover can appreciate. The wallet comes packed with eight different card slots, as well as two money pockets at the back. It feels a bit stiff at first, but the leather grows softer and more supple over time. It creates just enough friction when sliding in and out of a pocket, making it more difficult for pick pockets to slip out unnoticed. Overall it’s an excellent wallet for someone concerned with thickness, but it’s a bit thicker than some of the non-leather slim wallets on the market today. For anyone looking to slim down his wallet by carrying a bit less, the SimpacX Ultimate Slim mini wallet is a good way to go about it. It’s a hyper-slim product with a nice finish, a rugged feel and just enough space for the essentials. The wallet comes with just three card slots, a single spot for bills, one utility pocket and a license holder. It’s composed of genuine leather and it has a nice tough feel in the hand. One of the nicest features of this product is that it remains flat when laid out on a table, even when completely full. It’s a comfortable carry, and when filled with the appropriate amount, it’s hard to remember the wallet is even there. The only real downside to this wallet is the logo showed off on the front, but it’s modest enough that it isn’t a major issue. The Minimalist front pocket wallet is a good compromise wallet for men that want less bulky pockets without giving up too many cards in the process. It comes packed with space for seven different credit cards, which is pretty crazy in a wallet this slim. 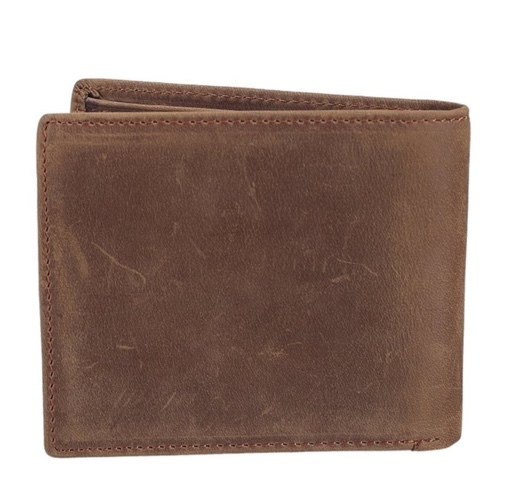 It’s made from supple Nappa leather, which is a nice touch that makes the wallet feel and look luxurious. It comes with a removable money clip, making it easy to carry bills when necessary, and allowing for an even slimmer fit when it isn’t. 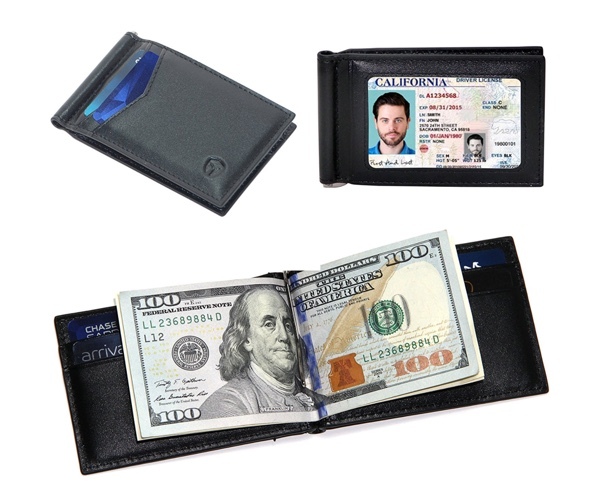 To top it all off this wallet relies on one of the more advanced RFID blocking setups, allowing it to block a wide range of frequencies to protect your cards. The Victorinox Men’s Altius leather wallet is a modern-looking product that offers a good mix of space and a slim profile. It’s made from Nappa leather and feels nice in the hand. 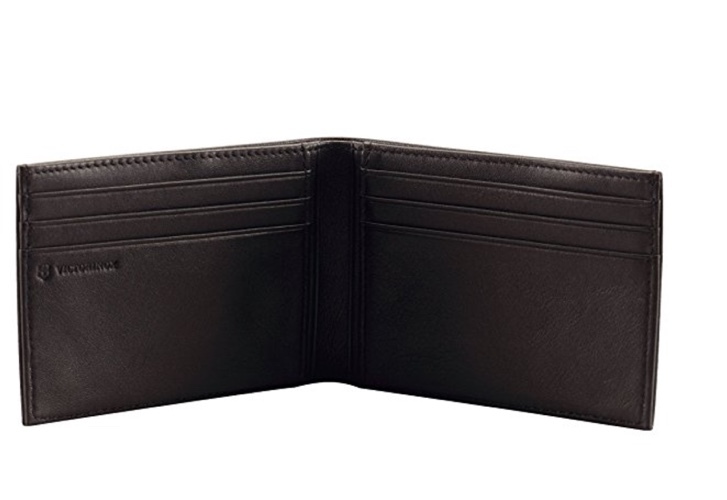 The wallet comes with a total of eight card pockets, though only six are visible. It has a single section for paper bills and that’s about it. It doesn’t have a plastic ID window, which makes it ideal for people that prefer to remove their ID’s and hand them over when necessary. The wallet grips cards nice and tight, it has a slim profile when loaded up with bills and cards, and it benefits from thick stitching for a nice solid feel. Overall, this wallet from Victorinox is a good mix of quality, slenderness and aesthetic appeal. It’s a stylish wallet that will hold up well to regular use without being too bulky to carry in a front pocket. Just don’t try to cram too many paper bills into it or they will begin poking out. Out of all the wallets reviewed, the Passcase Bifold leather wallet is the most attractively styled and looking. It has a nice worn appearance that many people will enjoy. It’s obvious the product is made from good thick leather and heavy stitching that will hold out during use. It has a total of six credit card slots, two misc slots, an ID holder and two full-sized money pockets, making it a good all-around wallet. 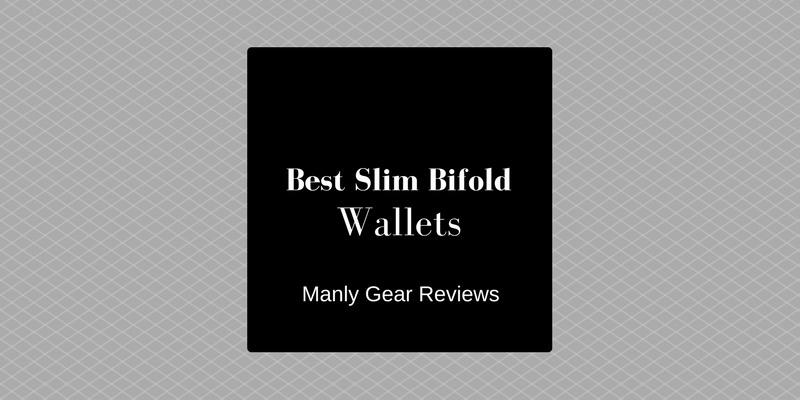 This isn’t the slimmest wallet being reviewed, but it has a more slender profile than the full-sized wallets that most people are carrying. The leather is a top grain vegetable tanned material that is soft and supple and will only grow softer over time. It’s a good product for people looking to downsize a bit without compromising, or for buyers trying to find a truly beautiful wallet that they’ll want to show off.